Why everyone who likes ancient Middle Eastern history should read the works of Josephus. The contributions of the first century writer, historian, and apologist, Josephus are innumerable. His words wield such rich treasures in historical and theological artifacts, and are so well known for almost two millennia, that he likely is the most taken-for-granted author ever. Old English print copies, online versions, and even a movie has covered a portion or all of his works, which makes him so celebrated, that it feels like qualifying anything from him is stating the obvious. His works are well prepared and documented, and carry little controversy or surprise to almost anything. He simply adds more details to the already known historical records, and does a superb job with this, but his narrative writing form is very gripping – especially the The Jewish War. There are many parallels to the New Testament record and then some more. Nowhere else can one find such in-depth information about the Herod dynasty than his accounts. Josephus was captured by the Romans in a rebellion against them, and became a slave and interpreter for the Emporer Vespasian. He was considered a defector by the Jewish community. The majority of his writing was spent to reestablish two things: reacceptance into the Jewish community by defending Jewish values, history, and literature from a Graeco-Roman perspective. Secondly it was to defend Judaism against the Graeco-Roman community who disbelieved the Jewish accounts, and found them inferior to their own religious beliefs and historical records. He covers theology, and Biblical texts in great detail because of this. One can find special accounts about Moses, Noah’s Ark and many more not found anywhere else. Jacob Feeley, a PhD Candidate at the University of Pennsylvania in Ancient History, published a state-of-the-union address on academic pursuits of Josephus’ works entitled, The Understudied and Marginal Josephus: Bringing Him into the Conversation, which is well worth taking the time to read. The writings of Josephus are a must-read for anyone that has an interest or commitment to the New Testament writings, or Jews, wanting to know their own history. His style is not that difficult to comprehend. It is actually a pleasurable read compared to most historical writers. It should be the first book outside of the Bible given to novices who wish to understand the history and context related to the life of Christ. There is a reference to Christ, albeit a very small one, and arguably may not even exist in the original text, and one about John the Baptist, which once again is small piece, but preserves the idea that John the Baptist was a prominent figure during that time. What is the most captivating is his coverage on the insurrection, and utter destruction of Jerusalem. He took into account the political, social, and personal complexities of war from both the Roman and Jewish camps that few writers are seldom able to achieve. It is a sad story, but very much fits into why Christ said, “When you see ‘the abomination that causes desolation’ standing where it does not belong—let the reader understand—then let those who are in Judea flee to the mountains. Let no one on the housetop go down or enter the house to take anything out. Let no one in the field go back to get their cloak. How dreadful it will be in those days for pregnant women and nursing mothers!” (Mark 13:14-17 NIV) If you read, or have already read Josephus with this in mind, you will know what is meant here. Josephus’ stories still come alive. As I once stood on the top of Masada and looked out across to the high hills that border around it, the stone rows used by the Romans for their camps are still clearly visible. Masada and those stones have very little meaning outside of Josephus, but because of his words, it caused me to imagine this fortress two thousand years ago, and brought this place alive again. My copy of Josephus is worn, as shown by the picture above. Once you start reading, it won’t take long to wear the book out, or if you have it on an e-reader, it may establish the top position on your reader list for historical non-fiction. 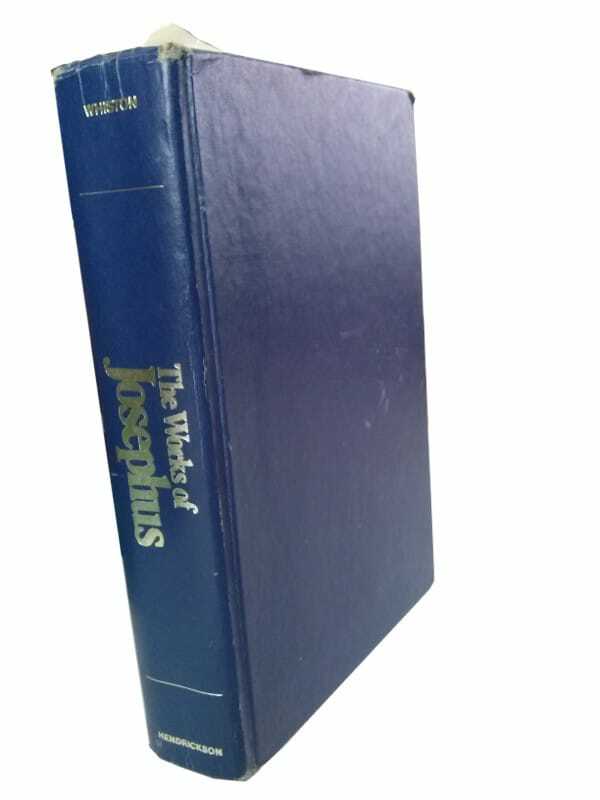 The works of Josephus can easily be found online, or as an ebook, or in print.